Baumgartner, B.; Bojdys, M. J.; Skrinjar, P.; Unterlass,* M. M. Macromolecular Chemistry and Physics 2015, DOI: 10.1002/macp.201500287. Hydrothermal polymerization, a benign synthesis for aromatic polyimides, is studied in detail to gain greater insight in the ongoing mechanisms. By performing an extensive set of experiments at various parameters, polyimides of outstanding crystallinity are obtained and could thus refine their crystal structure from powder XRD data. Initial condensation intermediates could isolate, which indicates that HTP is mechanistically closely related to classical step-growth polycondensations. This is the pre-peer reviewed version of the following article: Baumgartner, B.; Bojdys, M. J.; Skrinjar, P.; Unterlass,* M. M. Macromolecular Chemistry and Physics 2015, DOI: 10.1002/macp.201500287, which has been published in final form at [DOI: 10.1002/macp.201500287]. Bojdys,* M. J. Macromolecular Chemistry and Physics 2015, DOI: 10.1002/macp.201500312. As of 2015, the number of mobile phone subscriptions outstrips Earth’s human population. Critical raw materials (CRMs) and silicon, won in energy intensive refinement make up the electronics in all these devices. While graphene still has to deliver on its potential in electronic applications, we look to 2D polymer materials that go beyond silicon and graphene. This is the pre-peer reviewed version of the following article: Bojdys,* M. J. Macromolecular Chemistry and Physics 2015, DOI: 10.1002/macp.201500312, which has been published in final form at [DOI: 10.1002/macp.201500312]. 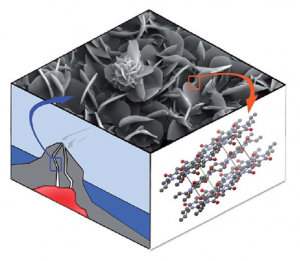 Carbon nitride vs. graphene – now in 2D! Cooper, A. I.; Bojdys,* M. J. Materials Today 2014, 17, 468–469. A polymer laboratory might not be your first port-of-call for replacement materials for silicon in sensors and transistors, but polymer chemistry and organic synthesis may have much to offer here: enter the world of modular chemical design of new 2-dimensional materials. This article is published under the terms of the Creative Commons Attribution-NonCommercial-No Derivatives License (CC BY NC ND) in final form at [DOI: 10.1016/j.mattod.2014.10.001]. Algara-Siller, G.; Severin, N.; Chong, S. Y.; Björkman, T.; Palgrave, R. G.; Laybourn, A.; Antonietti, M.; Khimyak, Y. Z.; Krasheninnikov, A. V.; Rabe, J. P.; Kaiser, U.; Cooper,* A. I.; Thomas, A.; Bojdys,* M. J. Angewandte Chemie International Edition 2014, 53, 7450–7455. In their Communication on page 7450 ff., A. I. Cooper, M. J. Bojdys, et al. report crystalline thin films of triazine-based graphitic carbon nitride (TGCN). TGCN is structurally similar to graphite but it is a semiconductor, and the thin films display a direct bandgap between 1.6 and 2.0 eV. Graphitic carbon nitride has been predicted to be structurally analogous to carbon-only graphite, yet with an inherent bandgap. We have grown, for the first time, macroscopically large crystalline thin films of triazine-based, graphitic carbon nitride (TGCN) using an ionothermal, interfacial reaction starting with the abundant monomer dicyandiamide. 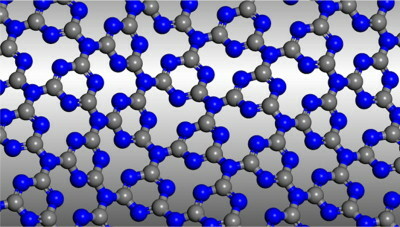 The films consist of stacked, two-dimensional (2D) crystals between a few and several hundreds of atomic layers in thickness. Scanning force and transmission electron microscopy show long-range, in-plane order, while optical spectroscopy, X-ray photoelectron spectroscopy, and density functional theory calculations corroborate a direct bandgap between 1.6 and 2.0 eV. Thus TGCN is of interest for electronic devices, such as field-effect transistors and light-emitting diodes. This is the pre-peer reviewed version of the following article: Algara-Siller, G.; Severin, N.; Chong, S. Y.; Björkman, T.; Palgrave, R. G.; Laybourn, A.; Antonietti, M.; Khimyak, Y. Z.; Krasheninnikov, A. V.; Rabe, J. P.; Kaiser, U.; Cooper,* A. I.; Thomas, A.; Bojdys,* M. J. Angewandte Chemie International Edition 2014, 53, 7450–7455, which has been published in final form at [DOI: 10.1002/anie.201402191]. Baumgarten, B.; Bojdys, M. J.; Unterlass,* M. M. Polymer Chemistry 2014, 5, 3771-3776. Inspired by geological ore formation processes, we apply one-step hydrothermal (HT) polymerization to the toughest existing high-performance polymer, poly(p-phenyl pyromellitimide) (PPPI). We obtain highly-ordered and fully imidized PPPIs as crystalline flakes and flowers on the micrometer scale. In contrast to classical 2-step procedures that require long reaction times and toxic solvents and catalysts, HT polymerization allows for full conversion in only 1 h at 200 °C, in nothing but hot water. Investigation of the crystal growth mechanism via scanning electron microscopy (SEM) suggests that PPPI aggregates form via a dissolution-polymerization-crystallization process, which is uniquely facilitated by the reaction conditions in the HT regime. A conventionally prefabricated polyimide did not recrystallize hydrothermally, indicating that the HT polymerization and crystallization occur simultaneously. The obtained material shows excellent crystallinity and remarkable thermal stability (600 °C under N2) that stems from a combination of a strong, covalent polymer backbone and interchain hydrogen-bonding. Katekemol, P.; Roeser, J.; Bojdys, M. J.; Weber, J.; Thomas,* A. Chemistry of Materials 2013, 25, 1542–1548. A novel covalent triazine framework (CTF-0) was prepared by trimerization of 1,3,5-tricyanobenzene in molten ZnCl2. The monomer/ZnCl2 ratio, the reaction time, and temperature significantly influence the structure and porosity of such networks. XRD measurements revealed that crystalline frameworks can be formed with surface areas around 500 m2 g-1 and high CO2 uptakes. Increasing the reaction temperature yielded an amorphous material with an enlarged surface area of 2000 m2 g-1. This material showed good catalytic activity for CO2 cycloaddition. Reprinted with permission from Katekemol, P.; Roeser, J.; Bojdys, M. J.; Weber, J.; Thomas,* A. Chemistry of Materials 2013, 25, 1542–1548. Copyright 2013 American Chemical Society. Bojdys,* M. J.; Severin, N.; Rabe, J. P.; Cooper, A. I.; Thomas, A.; Antonietti, M. Macromolecular Rapid Communications 2013, 34, 850−854. The carbon nitride PTI/Br is a layered, graphitic material of 2D covalently bonded molecular sheets with an exceptionally large gallery height of 3.52 Å due to the intercalated bromide anions. The material can be cleaved both mechanically and chemically into thin sheets and scrolls analogous to the carbon-only systems graphite and graphene. This is the pre-peer reviewed version of the following article: Bojdys,* M. J.; Severin, N.; Rabe, J. P.; Cooper, A. I.; Thomas, A.; Antonietti, M. Macromolecular Rapid Communications 2013, 34, 850−854, which has been published in final form at [DOI: 10.1002/marc.201300086]. Veith,* G. M.; Baggetto, L.; Adamczyk, L. A.; Guo, B.; Brown, S. S.; Sun, X.-G.; Albert, A. A.; Humble, J. R.; Barnes, C. E.; Bojdys, M. J.; Dai, S.; Dudney, N. J. Chemistry of Materials 2013, 25, 503-508. Lithiated graphitic carbon nitride (C3N4) was fabricated by electrochemical and solid-state reactions. The addition of Li to C3N4 results in a reaction between the Li and the graphite like C3N species in C3N4. This irreversible reaction leads to the formation of Li-CH=NR and Li-N=CR2 species which are detrimental to anode properties. 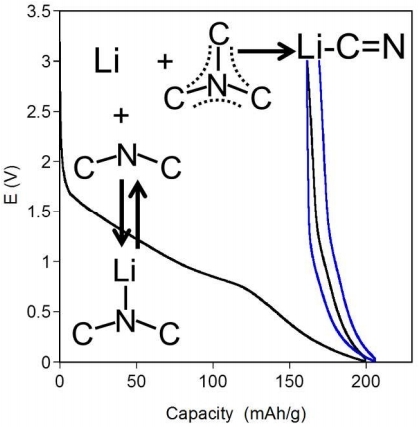 Suitable nitrogen doped carbon structures for anode applications are shown to need high concentrations of pyridinic C-N-C terminal bonds and low concentrations of quaternary C3N species to boost electronic conductivity and reversibly cycle Li-ions. Reprinted with permission from Veith, G. M.; Baggetto, L.; Adamczyk, L. A.; Guo, B.; Brown, S. S.; Sun, X.-G.; Albert, A. A.; Humble, J. R.; Barnes, C. E.; Bojdys, M. J.; Dai, S.; Dudney, N. J. Chemistry of Materials 2013, 25, 503-508. Copyright 2013 American Chemical Society. Chong, S. Y.; Jones, J. T. A.; Khimyak, Y. Z.; Cooper, A. I.; Thomas, A.; Antonietti, M.; Bojdys,* M. J. Journal of Materials Chemistry A 2013, 1, 1102-1107. Poly(triazine imide) (PTI) – a 2D, layered graphitic carbon nitride network – was obtained as an intercalation compound with bromide (PTI/Br) and fluoride (PTI/F). The gallery height varies with the diameter of the intercalated anion: small guests are situated in the large voids in the C, N plane, while larger guests protrude into the inter-layer space.